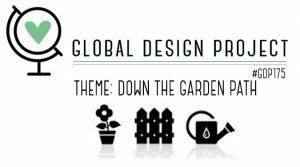 I am having so much fun participating in the Global Design Project challenges. This week the challenge is creating to a theme … Down the Garden Path. I created this card on a Facebook live in my VIP customer group last week. I had just received the Painted Seasons products that day and was excited to give them a whirl. Considering the GDP theme is Down the Garden Path, this was perfect. 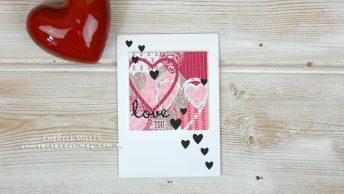 There is quite a bit going on with this card, and it is definitely for the Avid Crafter. I started with a layer which was brayered (using foam brayer) with Granny Apple Green ink. Then I wanted to add some leaves, because our garden has lots of leaves (really? that’s odd). These leaves are from the Well Written Framelits Dies. They have been die cut from Whisper White Card, adhered onto the brayered background with Multipurpose Liquid Glue and then brayered over the top. The diecuts pick up the ink, and so take on a slightly darker hue. I love this “faux embossed” look. 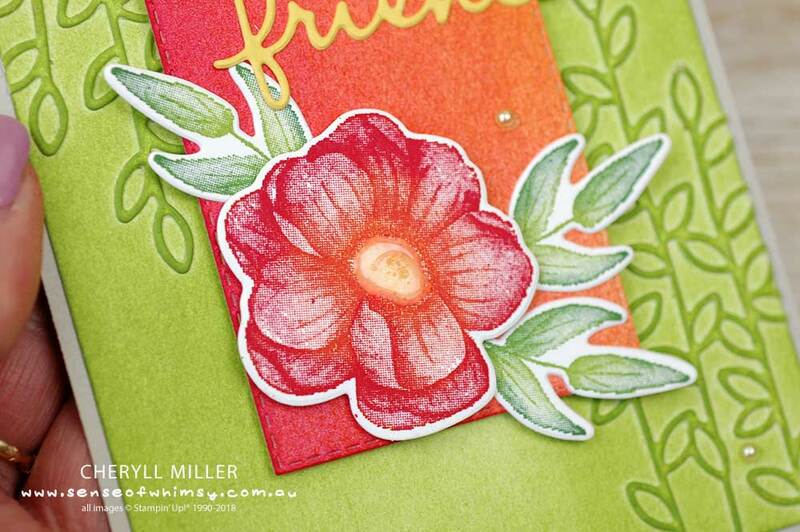 The flower and leaves are from the Painted Seasons stamp set …. 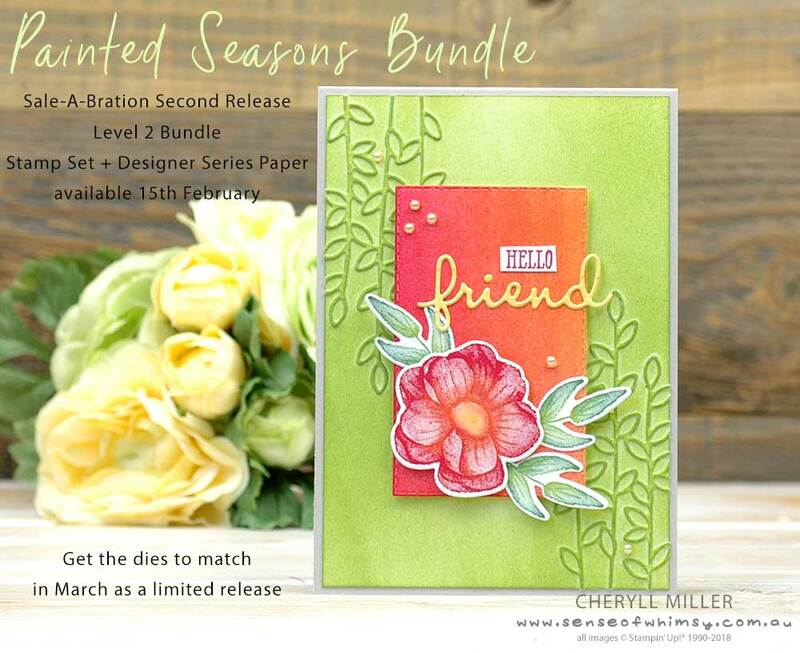 this Sale-A-Bration stamp set will be available 15th February, for free bundled with the Painted Seasons Designer Series Paper, for a purchase of AU$180 during Sale-A-Bration. You might be wondering how I so neatly cut out the stamped images? 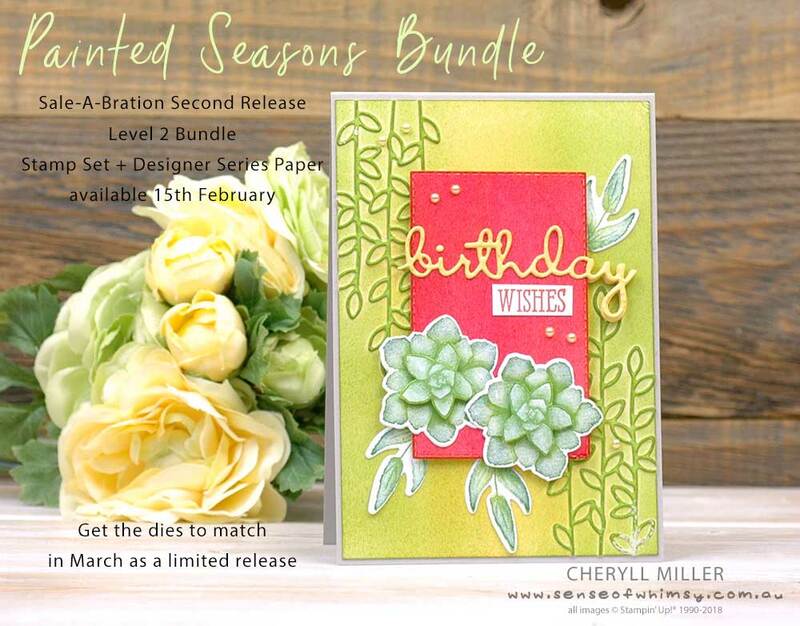 For March only, there will be die sets available for purchase which co-ordinate with selected Sale-A-Bration stamp sets. 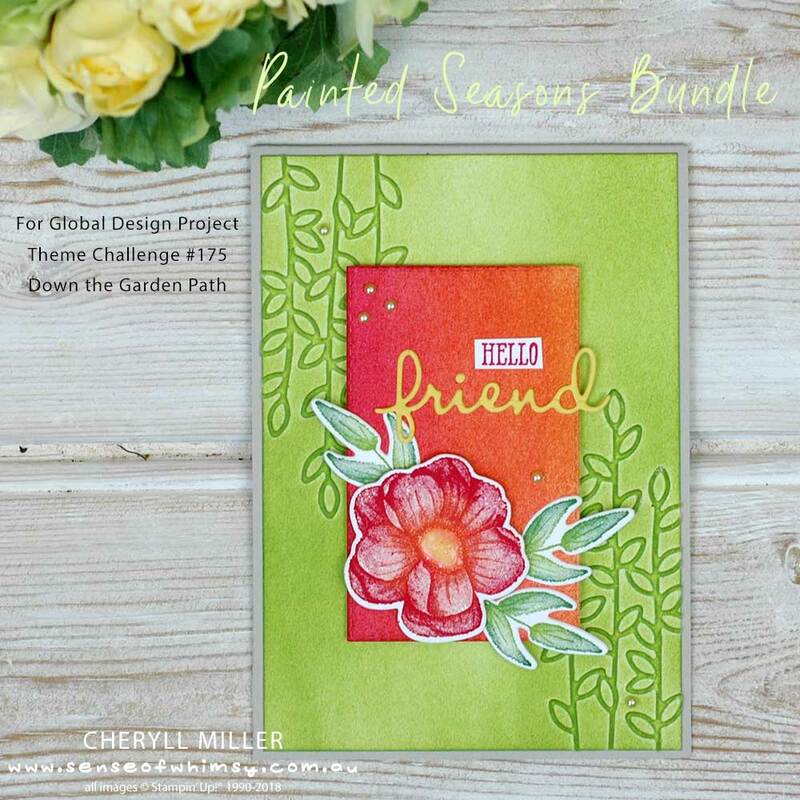 The Painted Seasons Stamp Set is one of those sets for which dies will be available. I coloured this flower using my Stamparatus and sponge daubers. They are nicely framed by the panel die cut with a Rectangle Stitched Framelit die and then brayered with Melon Mambo and Pumpkin Pie inks. 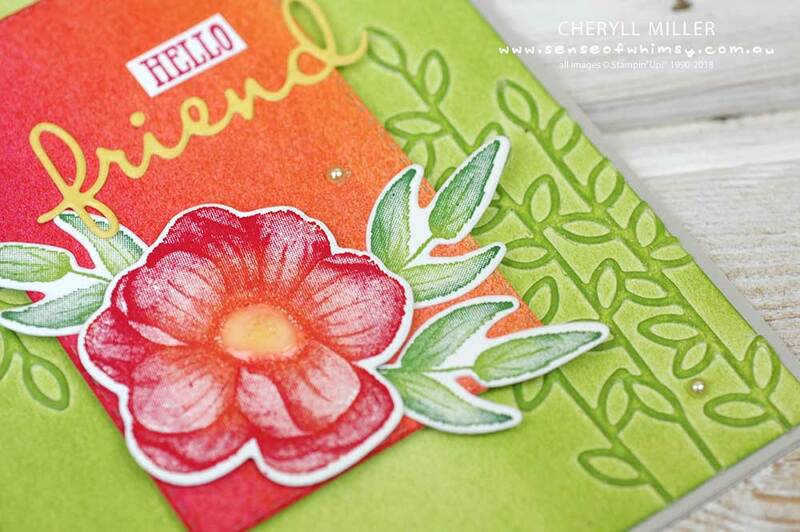 The word “friend” is from the Well Written Dies, and “hello” comes from the Well Said stamp set. 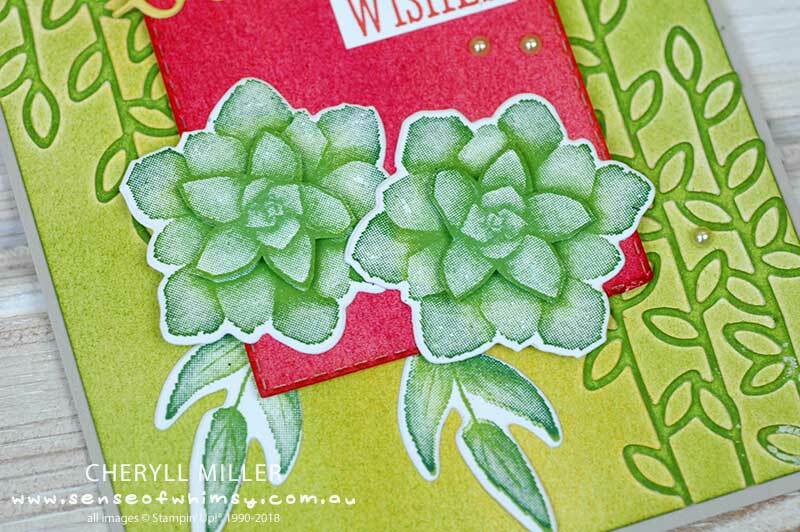 While I was playing around with this new Painted Season Stamp Set, I created a similar card using the Succulent stamp. Again, the succulents are coloured using the Stamparatus and sponge Daubers. I love the intensity of colour that can be achieved with the foam brayers. Ink gives a luminosity that you just don’t get with a solid coloured cardstock. 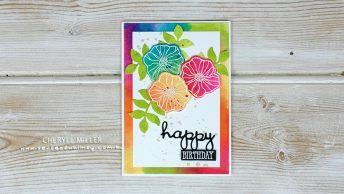 Join my Inks and Whimsy Stampin’ Up! team. See all my tutorial bundles and online classes here. Looks beautiful Cheryll, loving all the beautiful bright colours..
Lovely card Cheryll. Great techniques. Loved your video. Beautiful!!! Love how you used a sponge prayer to add varied colors, it’s really striking.